Nobody notices the elderly man as he makes his way down Amable Street in the heart of Quebec City. A strong gait, robust frame, and bushy white mustache stained with tobacco, are a familiar sight. He often walks this way and has a seat on the bench, turning his face towards the sun. The warmth relaxes him and he takes a deep breathe. Reflecting on his past he remembers with a smile that day long ago when he changed his future forever. Everyone is talking about the Fenians and how they are planning to invade Canada. His dream is to join the army and he knows he has to be a part of it. The thoughts flash through his mind; he may not be accepted because his father and mother (God Rest Her Soul) were both from Ireland. He is Canadian though, born in Quebec City on a cold December day in 1852. Joining turns out to be easy, he tells them his name, William Jordan and signs with an X beside where they wrote it. The next thing he knows he is an official bugler for the 8th Battalion in Quebec City. He can’t believe his luck; wait until his friends hear the news. He is a little nervous about telling his father, Samuel, even though the extra income will be appreciated. After the death of William’s mother Mary, Samuel remarried to Matilda Nelson, widow of John Manly. Matilda and Samuel married on December 1860 and there were three young children watching that wedding, William, his sister Eliza and Matilda’s daughter Ellen. He smiles to himself, picturing what his sisters will think of their brother in uniform. Arriving home he burst in with the news that he is a bugler for the local battalion. He finds his worrying was needless as his family are happy for him, they know this is his dream. The friendships and sense of belonging with his battalion is exactly how he had imagined it. He has found his place. Life is grand. He sure looks sharp in his uniform and the girls notice. …the shock of his Catholic girlfriend Anne telling him he is to be a father. Not one to shirk from his duty, he goes through the necessary channels for a Protestant to marry in the Catholic Church. On June 5,1872 at St. Patrick’s Church in Quebec City William Robert Jordan son of Samuel and Mary Quigley and Anne Ready daughter of Thomas and Margaret Pendergast are joined in marriage. It is none too soon as a little later in the month their son William is born. The happiness of having a son is quickly dispelled when William Jr. dies at the beginning of July. Holding him in his arms for the last time, William for the first time feels helpless. Their next son Samuel is a joy to the family and the next three children Mary, William and Peter are all healthy; his family is growing. In 1879 tragedy strikes the household. In June his son William, who turned two last month, dies. If that isn’t hard enough, the next day Mary age five joins her brother. Knowing he will never hear the sound of their voices again is unbearable. A quietness falls over the house, a fear of who is next. Anne his wife is prostrate with grief, how can she lose her children and go on? A numbness keeps her going, but the family isn’t done it’s suffering. Anne dies along with their 6th child in April of 1880. William shakes his head, what a hard time that was. He smiles up at his wife, thankful for what he has now and amazed at all he has seen. Lunch was wonderful as usual. Normally after lunch he would find things around the house that needed fixing but today he decides to lie down and get some rest. His wife is puzzled as he is acting like in a trace. She doesn’t say anything but makes a note to call the doctor. William can’t escape his memories, they join him in sleep as well. He sees himself in Kingston, Ontario at Fort Henry. It is an adventure to be in this new place far from home. He wonders how his two small boys Samuel and Peter are doing but knows they are in better care with his father, stepmother and their daughter Matilda. Life is great at Fort Henry he is able to find time to meet some of the local people. One person in particular catches his eye and even though she knows he has two children she says yes when he asks her to be his bride. What a relief to not have to go through all the red tape it took to marry a Catholic, Agnes is Protestant like himself. 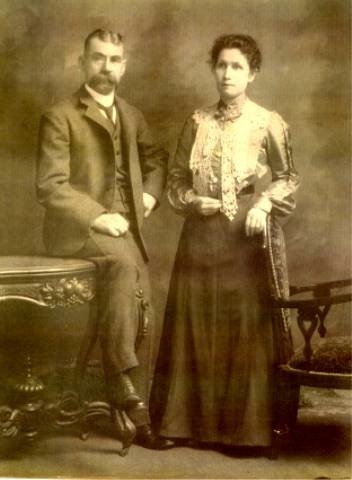 On Sept. 2, 1881 in Kingston, Ontario Agnes Brown and William Jordan are married. The two young children are sent for and shortly there after 2 more children join them John and Mary. Finally the family is altogether. 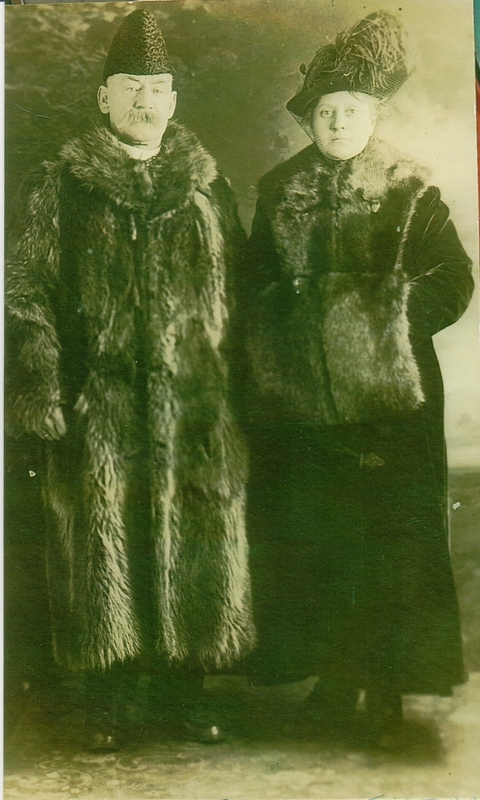 William Jordan with his 2nd wife Agnes Brown. At 33 years old William is ready to take some of his lifelong military knowledge and put it to work. So it is with enthusiasm that he leaves the city and his family to help quell the rebellion in the North West. The ruggedness of the terrain and remoteness doesn’t bother him. This is what he has been trained for. The battle of Cut Knife Creek is surprisingly difficult. Amazingly a number of men in his Battery are getting wounded, this was supposed to be an easy win. William manages to avoid any injuries, but after it is over his ears are ringing from the guns he has been trained to shoot. Waking up from his light sleep William wanders over to the drawer where his medals are; such small objects that hold so many reminders of his life. Coming back home to Quebec from the Rebellion there are many celebrations and the happiest people to see him are his wife and 4 children. It isn’t long before their fifth child William joins the family and makes it complete. Shortly after arriving home a teaching position is open at the Citadel, William uses the opportunity to pass on his wealth of knowledge. It is a perfect day for an Assault-at-Arms. He glances over to where her Royal Highness is seated right next to the Marquis of Lorne. He isn’t feeling nervous because he has never been out matched in sword, bayonet or single-stick. The competition is thrilling because joining them is the Royal Navy Squadron. This adds to the excitement as it means fresh faces and unknown opponents. Battling against Bombardier McKay is going to be difficult. McKay is also from the Citadel and his skills closely match William’s. At one point, during the battle, William isn’t fast enough and receives a wound on his right hand. Quickly he shakes it off, it is nothing serious and he goes on to win the day. the reminders of his boxing days. What a feeling to be in the ring and know one can’t be beat. Winning the feather and lightweight championship medals for the Province of Quebec and Kingston, Ontario. Standing and receiving congratulations from colleagues is a rewarding experience. William continues to wander around the house looking at family photos. So many of the people in his thoughts are no longer alive like his parent’s or his sister Eliza who died when she was just seventeen years old. He cradles a photo of his half sister Matilda, now buried at the local cemetery. Matilda followed in his footsteps by rushing into a marriage to John Perry, before their first child joined them. His stepsister Nellie, who he had so much fun teasing when they were little, married John Gore. Looking at photographs of his sons and realizing most of them moved away, Peter in Montreal, John in England, Samuel in Kingston, only William staying in Quebec City. His only daughter Mary standing so proud in the photograph of her and her husband John Frost and living in Kingston as well. A photo of Agnes, his second wife, catches his eye. After 31 years of marriage she had passed away in 1912. What wonderful memories he has of her. He remembers making the decision to marry for the third time to Ellen Gibbs, the widow of Frank Kingston. 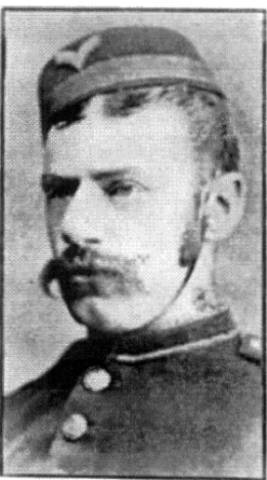 At the ripe age of 61 on April 3, 1913 in St. Matthew’s Church, Quebec City, he made his final journey down the aisle. William Jordan with wife Ellen Martha (nee Gibbs) Kingston. William feels the day catching up with him and lays himself down after a hearty supper. It is to be his last. The next morning Ellen calls him down for breakfast but he doesn’t respond. She smiles to herself, remembering his hearing was damaged during the North West Rebellion. She heads upstairs so he can hear her calling, but he is already gone. 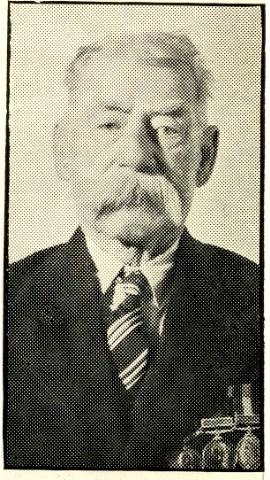 William led a very full and interesting life that came to an end on September 27, 1938 when he was 86 years old. William also passed on his passion of military life. Each one of his sons was active in the military for some part of their life. The Jordan family until quite recently has been represented in the Royal Canadian Artillery since it was formed in 1871. Written by me waaaaayyyyy back in 2002!